Methods for determination of true luminescence and luminescence excitation spectra of separate components in multicomponent absorbing media are presented. They are based on the use of the derived relations describing a) distortions of measured luminescence intensities as a result of emission re-absorption and b) photoluminescence excitation spectra of emission centers being in multicomponent media with overlapped luminescence and absorption bands or absorption bands of various components. It is shown that these methods are applicable for the qualitative molecular analysis of such media. 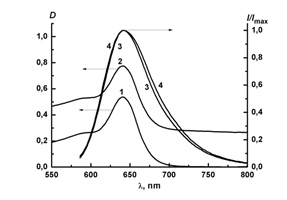 For determination of the true luminescence or luminescence excitation spectrum of a separate component for the purpose of its identification it is necessary to measure the total medium absorption spectrum and dependence of luminescence intensity on a luminescence wavelength or on an excitation wavelength. The high-sensitivity luminescent method for the quantitative analysis of the multicomponent media has been developed. For its realization it is necessary to import into the examined medium a luminescent probe, whose absorption coefficient is known and the luminescence excitation spectrum of which overlaps the luminescence excitation spectrum of the analyzed substance. For the analysis the ratio of the luminescence intensities for the probe and the defined substance excited with the same wavelength is used. The method is suitable for scattering and strongly absorbing media and it is invariant in respect to changes of experiment geometry and to media parameters. It is characterized by a wide range of measured values. Its sensitivity is determined by the sensitivity of the luminescence intensity measurements. Organic substances concentrations with values approximately 10–10–10–11 g•cm–3 have been measured.